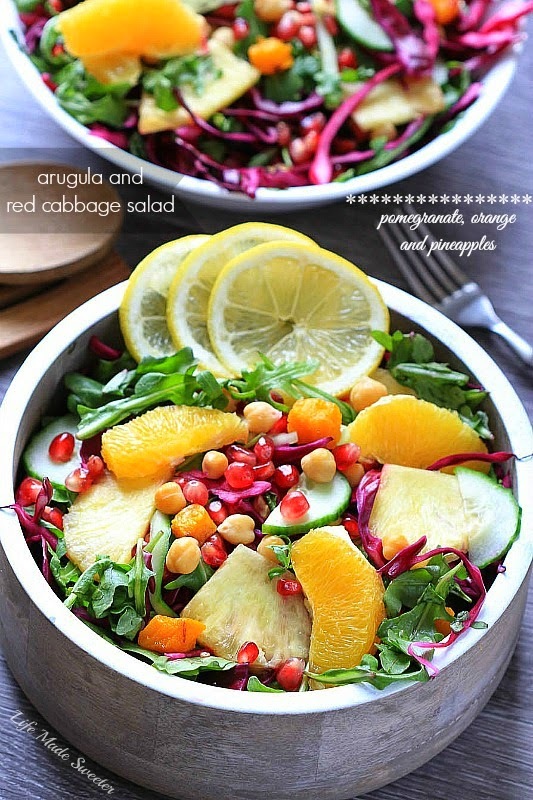 A healthy and refreshing arugula salad with red cabbage, sliced pineapples and oranges, pomegranate arils and chickpeas with an easy and delicious honey-lemon vinaigrette. Right around this time every year, I start dreaming about sunny skies and warm and tropical beaches. The temperatures have been frigid lately making it too cold for us to go outside much, so I’ve been trying to brighten up all of our meals with lots of color and refreshing flavors. 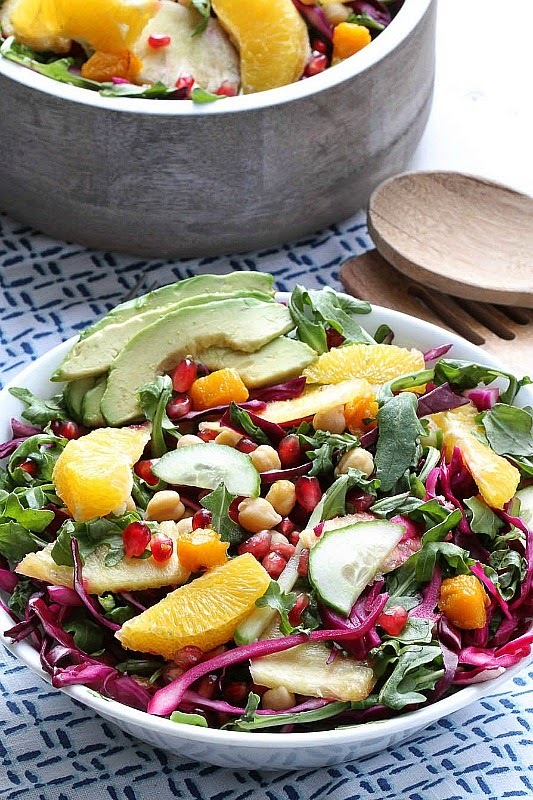 This is a bright and beautiful salad that you can put together quickly with ingredients that can easily be swapped out for what you have on hand. It starts off with some red cabbage tossed in a light and refreshing honey-lemon vinaigrette to soften the leaves slightly and soak up the tangy flavor. 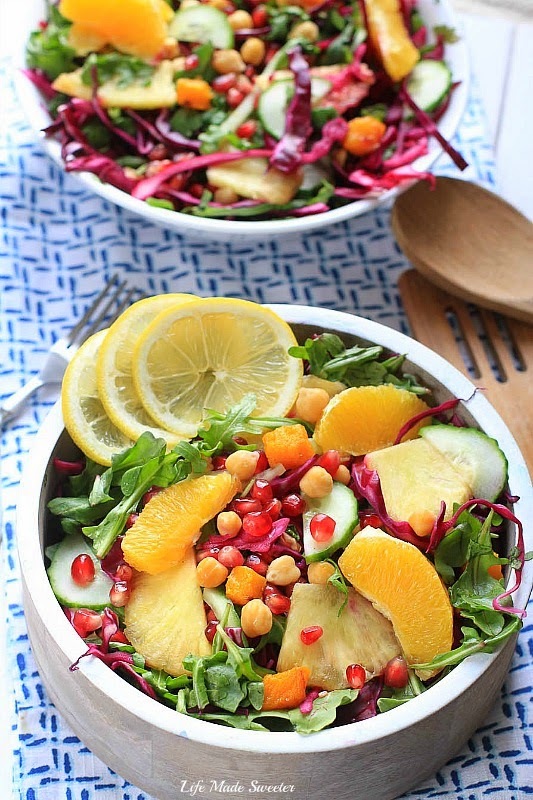 Combined with spicy arugula, sweet oranges, refreshing cucumbers, buttery chickpeas and sweet and tart pomegranate arils makes this a tangy, crisp, and colourful accompaniment to almost any meal. You can serve it alongside comforting chili in the winter, or bring it to a picnic barbecue in the summer. Since I always love salads with avocado, I sliced one up and added it in here as well. In a medium bowl, whisk all ingredients for vinaigrette together. Place sliced cabbage in a large bowl, pour a quarter to half of the vinaigrette over the cabbage and mix in to soak while you gather the rest of the salad ingredients. 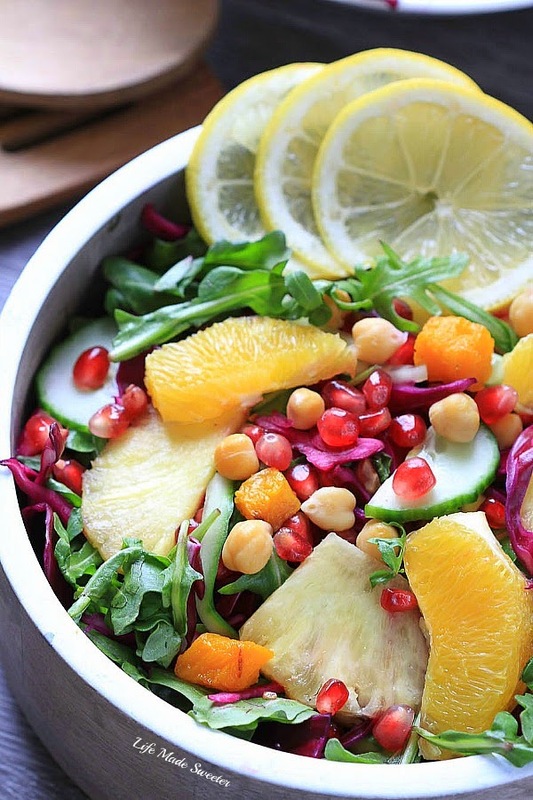 Meanwhile, cut the orange and pineapples into slices and add to the cabbage bowl. Throw in the arugula leaves, pomegranate arils and chickpeas, Drizzle with the rest of the vinaigrette and toss well. Top with your favorite nuts or more pomegranate arils and serve.